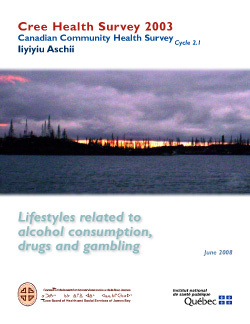 The survey was conducted during the summer of 2003 using a representative sample of residents aged 12 and older from the nine communities in Iiyiyiu Aschii: Chisasibi, Eastmain, Mistissini, Nemaska, Oujé- Bougoumou, Waskaganish, Waswanipi, Wemindji, and Whapmagoostui. Somewhat more than half (54%) of Iiyiyiu Aschii residents are current drinkers. Among these drinkers there are mostly men (61%) and young adults from 18 to 29 years of age (80%). A majority of separated, divorced, or widowed persons fall into the current drinkers group (64%), while persons in traditional or common-law marriages as well as those who have never been married are almost evenly divided between current drinkers and former drinkers. Between 1991 and 2003, the proportion of current drinkers rose from 49% to 53% in Iiyiyiu Aschii. The proportion of people who have never consumed alcohol, on the other hand, has fallen considerably over the same decade, going from 23% to 14%. People with higher levels of education consume alcohol on a weekly basis in greater numbers than do the others, but fewer of them consume more than five drinks on a single occasion. Current drinkers in Iiyiyiu Aschii consume alcohol less frequently than current drinkers in the rest of Quebec. When they do, however, they tend to consume more copiously (five or more drinks on a single occasion) than current drinkers in the rest of Quebec. One quarter (25%) of residents report having consumed at least one drug during the preceding year. Among residents of Iiyiyiu Aschii, cannabis is the drug most commonly consumed over the previous twelve months. Proportionally twice as many adolescents (12 to 17 years of age) and young adults (18 to 29 years of age) report having consumed at least one drug or cannabis during the preceding year as 30- to 49- year-olds. Individuals with higher educational levels have consumed one or more drugs, or cannabis, during the preceding year in smaller numbers than individuals with lower or intermediate levels of education. Separated, divorced, or widowed persons have consumed one or more drugs, or cannabis, during the preceding year in greater numbers than individuals in traditional or common-law marriages or those who have never been married. Proportionally twice as many residents of inland communities as residents of coastal communities have consumed at least one drug or cannabis over the preceding twelve months. Furthermore, three times as many have used cocaine in the same period. Inland community residents also consume cannabis more frequently than people in the coastal communities. There are half as many cocaine users in Chisasibi as in any of the other groups of communities. The consumption of drugs in the region increased between 1991 and 2003. Cannabis consumption over a twelve-month period rose from 15% to 21% in the past decade, while cocaine consumption rose from 4%* to 10%. Two-thirds (65%) of residents 12 years of age and older gamble. Women participate as much as men (67% vs. 62%). Proportionally, young people aged 12 to 17 gamble less (25%) than their elders (76% for those aged 18 to 19 and 69% for those aged 30 and over). Of all types of gambling studied, four are especially favoured by people in the region: bingo, instant lotteries, regular lotteries, and video lottery terminals. Among inhabitants of Iiyiyiu Aschii 9% have a gambling problem or are at risk of developing The proportion for the rest of Quebec is 2%. Generally fewer young persons in Iiyiyiu Aschii gamble (25%) than do those in the rest of Québec (51%).